You’ve seen her little black hearts and fortune cookie inspired wheat-pastes posted up across the city, sometimes they hit a bit too close to home, but the relatability is what drives their ubiquity and instagramability. Get to know Amberella in 20 questions! “Fasten seat belt while seated” – I woke up on a plane this morning! I was on the “Fashion Board” at Nordstrom in high school which entailed sharing trends and feedback with the buyers of the teen department. Mrs. Yoder, Peggy Hartzell, Karen Reynolds, and Colette Copeland- all being teachers and mentors ranging from middle school through college. Also shout out to all of the horrible ex boyfriends, thank you for the creative fuel. 4. If you weren’t an _____ what would you be? If I wasn’t an artist, I would pursue being an art therapist or have a farm and grow, grow, grow! That’s def on the radar as I get older. 5. 3 qualities that have helped you in my career? Letting go of fear/facing fear, which in turn means taking risks and breeds much growth and learning. Honesty and kindness does not go unnoticed by others, people remember how you treat them. And third, being very scheduled and focused (yet having the ability to be flexible when things change is key). Making my own schedule. Also collaborating with other artists or brands that I admire. A lot of people think that artists will work for fun or for free. It’s important that artists charge their worth to curb that idea. Diffusing essential oils and journaling, or if there is time to catch it, going to see the sunset. It’s a beautiful way to end even the worst day, and a reminder that a new day is coming SO soon. Either way, crying is happening. 10. What is your favorite ritual? Crying. HAHA … just joking. Taking a bubble bath every night was my favorite ritual, but my current home doesn’t have a bath tub 🙁 … so I’d say walking. I take at least an hour walk each day. 11. When do you feel the freest? When I’m surrounded by nature, that is truly my favorite place to be. Whether it’s in the mountains or by the sea … it’s where I feel freest. 12. Do you trust where life is taking you? 13. How much risk do you like taking? I’m a dreamer and believer of those dreams. The only way to see the dreams come to is risk. What I’m trying to say is I take huge risks to see my wildest dreams come true. 14. Who’d you invite to a fantasy dinner party? Anyone dead or alive. 15. When do you get nervous? At the top of the ladder! AND any time I have to speak in front of a large crowd. 16. What do you think about Love? It causes the most pain and most joy I’ve ever known in life. It’s necessary, life without love is nothing. Love is the ultimate power, truth, hope, and healer. 17. What are you most grateful for, right now, in this moment? The chance to begin again every day. To walk, to breathe, to have friends that love, laugh, and cry with me. Oh, and chocolate! Anything from the 60’s and 70’s. Also Courtney Barnett rules so hard. Gotten out of bed today, life is hard! 20. What’s your favorite pizza topping? 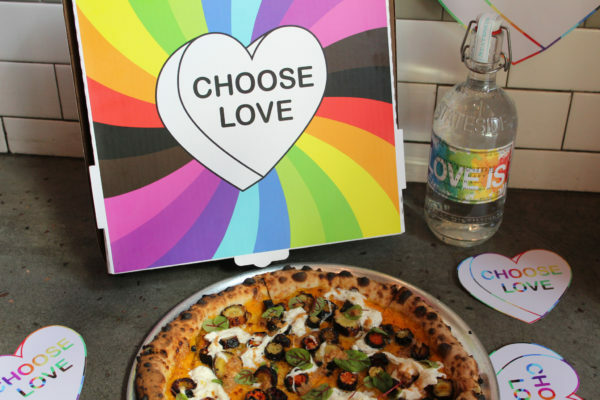 In honor of Pride month, Amberella has partnered with Pizzeria Vetri to create a special pizza box that features her ‘Choose Love’ power heart. The extremely limited edition box will be available for one week only (June 7th-14th) in-store at all PV locations (Philly, KOP and DC) and delivery exclusively via Caviar with every purchase of the specialty Pride pizza – the Arcobaleno (rainbow in Italian!). Pizzeria Vetri will also donate $1 from every Pride pizza sold to Philly Gay Pride to support their commitment to the advancement of LGBT rights. There is also a social media competition for consumers hosted on Instagram throughout the month of June. To enter, fans must post their own real-life examples of choosing love and what the phrase means to them for a chance to win free Pizzeria Vetri pizza for a year*, a one of a kind Amberella art piece and more. Check out the launch event happening Friday, June 1 at Pizzeria Vetri in Rittenhouse.